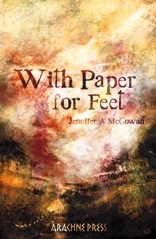 Having been diagnosed with Ehlers-Danlos Syndrome at the age of sixteen, Jennifer A. McGowan went on to become a mime artist, university teacher, calligrapher and recorded singer/songwriter as well as poet. In 2014 Arachne Press noticed and anthologised her work in The Other Side of Sleep [https://arachnepress.com/books/poetry/978909208186-the-other-side-of-sleep/] and has published her collection With Paper for Feet this year. The parting more than a sharpened demand. unhaunted on the shores of our desire. The war was just and only his pride. Got that? Listen and learn. Go make movies. Tell jokes if you must. Just don’t tell more lies. And stay away from the bloody swans. manners and once, they say, a great wit. I came late; I wouldn’t know. This is well-imagined storytelling, intriguing and well-paced, always with a distinctively generous poetic voice. A challenging and rewarding read.